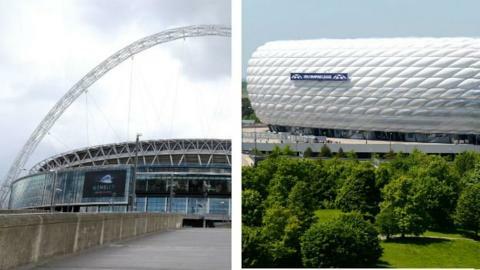 Either Wembley or Munich's Allianz Arena will host the final and both semi-finals of Euro 2020 says Uefa. European football's governing body will choose between the venues on 19 September. As well as bidding to stage the climax of the 24-team tournament, the Football Association has put London forward for three group-stage games and a match from the last 16 or quarter-finals. Wales and Scotland have bid for matches in Cardiff and Glasgow respectively. Scottish Football Association chief Stewart Regan said earlier in the week that it was "highly unlikely" there would be four winning bids from the United Kingdom and the Republic of Ireland, which will also submitted a bid on Friday. Both Scotland and Wales have applied to host group-stages matches and a last-16 tie. With the tournament to be hosted across 13 European cities, Azerbaijan, Belarus, Israel and Macedonia are among candidate nations who have never hosted a major tournament. But only England and Germany are in the running for the semi-finals and final after Turkey withdrew to focus on a bid to be sole hosts of Euro 2024. Wembley hosted Champions League finals in 2011 and 2013 and was the venue at which Germany beat the Czech Republic in the final of Euro 1996. Since the completion of its redevelopment in 2007, it now holds 90,000 spectators, compared with 71,137 at Allianz Arena, home of Bundesliga and European champions Bayern Munich. "We are extremely happy to have received so many bids to host Euro 2020," said Uefa president Michel Platini. "The 60th year anniversary edition of the tournament will be a historic one, with matches played in many European countries."